View More In Crutch Accessories. 1. With personalized and multi-functional design; designed to protect the handle of the working aid free from daily dirt, wear, tear and sunshine, easy to use, convenient, easy to install and disassemble and easy to clean. 2. Folding handle cover made of 100% pure cotton fabric and sandwich mesh material, which is soft, breathable and comfortable. With good moisture absorption ability, breathable, soft and comfortable and able to reduce the pain and fatigue caused by holding the handle for a long time. 3. Designed with hook & loop tape and elastic drawstring, which is tight, beautiful, easy to operate, convenient and easy to install, disassemble and clean. A. Handle cover with hook & loop tape, which can be freely pasted and adjusted, easy to operate, convenient and easy to install, remove and clean. B. Designed with wide elastic drawstring on the left and right sides of the handle cover, which makes the handle cover can be tightened well with the handle, is exquisite in craft, beautiful and tight. 4. 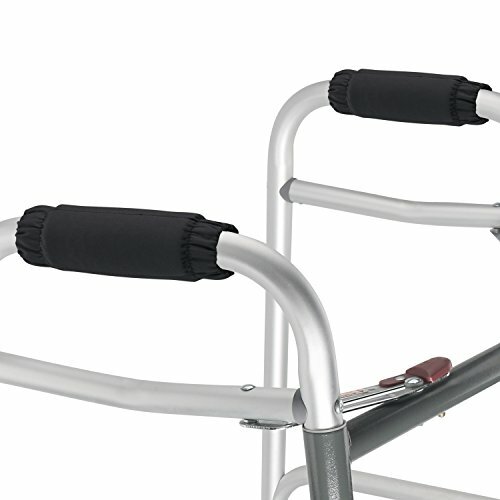 The handle cover is of free size, suitable for most walking aids of standard size. 1.Fasten the hook-and-loop fasteners at both the left and right sides. 2.Press the hooks and loops together to make the hook-and-loop fasteners fastened well. If you have any questions about this product by TOMMHANES AMISGUOER, contact us by completing and submitting the form below. If you are looking for a specif part number, please include it with your message.